The evaluation of baroreflex sensitivity (BRS), which maintains systemic circulatory homeostasis, is an established tool to assess cardiovascular autonomic neuropathy in type 2 diabetes mellitus (T2DM). As BRS plays an important function in blood pressure regulation, reduced BRS leads to an increase in blood pressure variability, which further leads to reduced BRS. This sequence of events becomes a vicious cycle. The major risk factors for reduced BRS are T2DM and essential hypertension, but many other risk factors have been reported to influence BRS. In recent years, reports have indicated that glycemic variability (GV), such as short- and long-term GV that are considered important risk factors for macrovascular and microvascular complications, is involved in reductions in BRS independently of blood glucose levels. In this review, we discuss reduced BRS in T2DM, its features, and the potential for its reversal. ”Information for Authors” has been changed. Please read it before submission, especially in case of "Case Report". 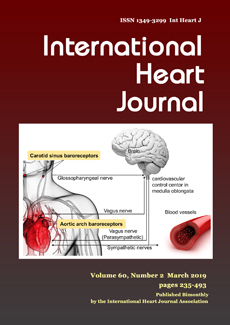 We have decided to stop publishing a print edition of International Heart Journal due to a decrease in demand. The last issue of the print edition will be the November 2017 (Vol.58, No.6) issue. Please use our open access online journal at J-STAGE for the January 2018 and all subsequent issues.